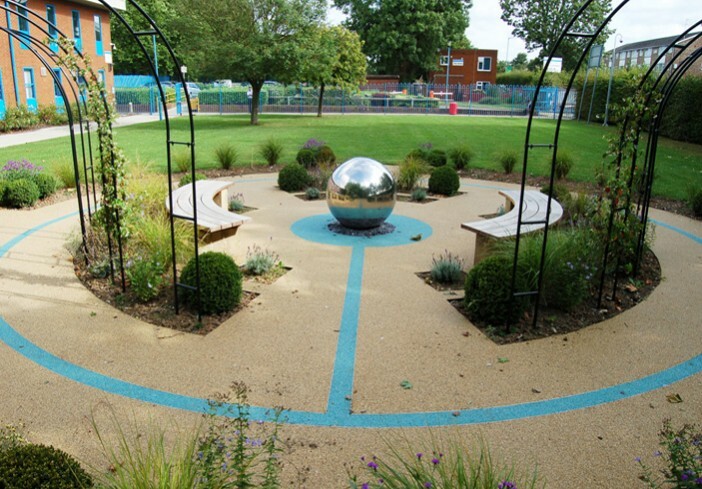 Cranford Community College’s ‘Circle of Life’ memorial garden uses the unique qualities of resin bound paving to provide the community with a practical yet beautiful sanctuary for the remembrance of past students and colleagues. 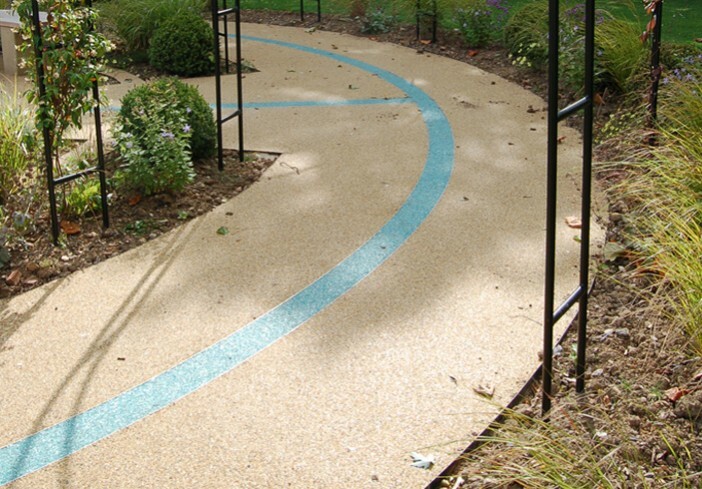 Cranford Community College’s ‘Circle of Life’ memorial garden uses the unique qualities of Clearstone’s PrismStone® a decorative resin bound surfacing system to provide the community with a practical yet beautiful sanctuary for the remembrance of past students and colleagues. “Sadly, over the past three years, several governors, staff and ex-students have died and, rather than have individual memorials such as benches or plaques, we wanted to create a memorial garden for anyone who needed peace and tranquillity,” says Assistant Head Teacher Alan Fraser. Families who have lost former members of the school community hold remembrance ceremonies in the garden and so it was crucial that the new design be accessible to everyone, in all weathers, and provide a peaceful haven in which to reflect. The college already had an existing garden. “But maintenance was a problem,” recalls Wendy Stokes, the landscape gardener tasked with the new design. Overgrown conifers made the garden seem dark and uninviting in gloomy weather; lawns and falling leaves meant maintenance was high. “My brief was to provide a low maintenance, reflective and restful space that was clean and contemporary. 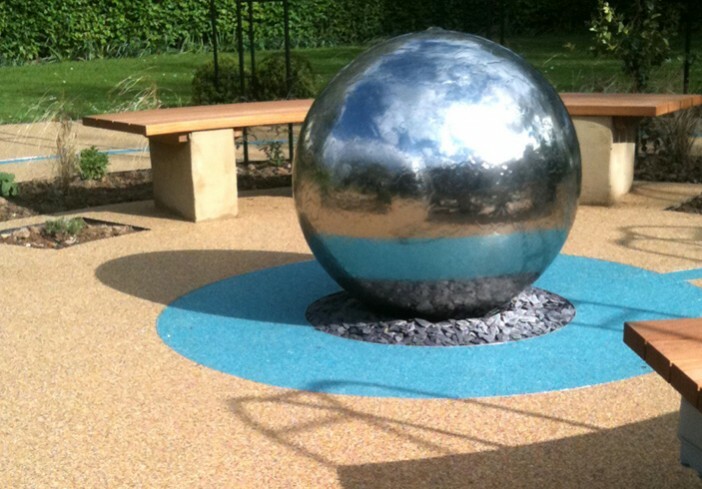 I chose a combination of Clearstone® and PrismStone® resin bound surfacing because it is low maintenance, wheelchair friendly and it keeps looking good for years,” says Wendy of Wendy Stokes Garden Design. The flexibility of resin bound paving lends itself to the creation of pattern and design to symbolise a theme, unlike your ordinary garden gravel. In this case, the college wished the garden to represent ‘The Circle of Life’ with water as a central theme. 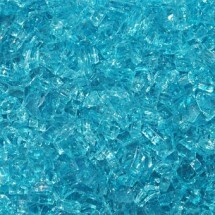 The inherent qualities of water are evoked through a circular flow of aquamarine glass and a reflective steel ball within a surround of warm Sienna resin bound paving. “Everyone is very impressed both with the design and what it represents,” says Alan Fraser. Situated at the entrance to the school, the garden provides a calm and tranquil first impression. 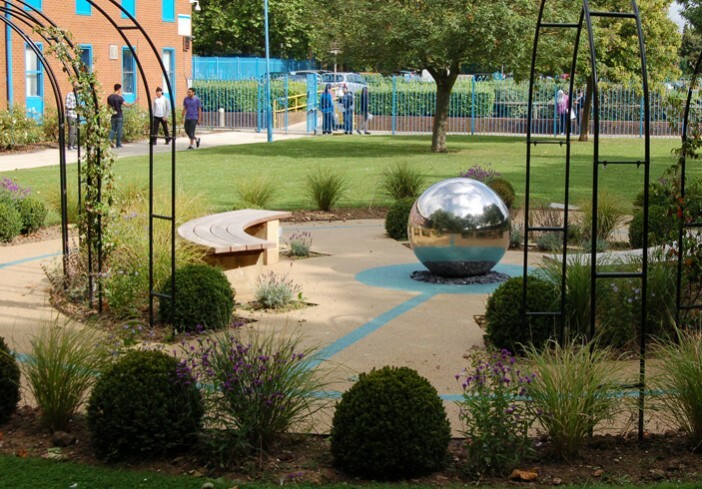 As the college serves a wide community – gaining the Diamond Award for Cultural Diversity in 2011 – the garden needed to be as inclusive as the college: “It’s there for everyone: people come and we direct them to the garden. It’s a place where people can go and have peace and quiet,” says Alan Fraser. Clearstone working for: Cranford Community College and Wendy Stokes Garden Designer. Design Service: To liaise with the college, garden designer and landscape contractor to ensure clear communication in bringing together all design elements for the garden. 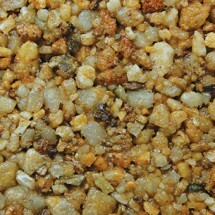 Area: Installed area 78 m2, laid at a thickness of 18mm.